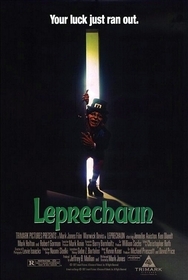 While my 25+ year horror genre viewing experiences unfortunately disallow me from claiming that Leprechaun is the stupidest film ever made, all else being equal, it should warrant that designation with, ahem, flying colors. On the one hand, maybe writer/director Mark Jones intended for Leprechaun to be camp. However, intentional camp isn't the easiest mode to achieve, and it definitely isn't achieved here. Rather, Leprechaun comes across as a wannabe fright-fest that is just incredibly bad-acted and scripted even worse. Occasionally, Leprechaun's overall quality reminded me of a show I used to watch on Saturday mornings called H.R. Puffnstuff. Although I wanted to retract that comparison the more that I thought about it because I remember enjoying H.R. Puffnstuff. Of course, I was probably 8 years old. The point is that Leprechaun's production values are no better than a typical hurried, shot-on-video presentation meant to impress kids and make a quick buck. The performances are mostly of junior-high-drama-class caliber and the writing and direction are ridiculous. So what is it about? Not much more than you could guess from the title. An Irishman, returning to South Dakota (??) from a trip to Ireland to bury his mother reveals that he found a bag of gold. Of course, it belongs to a leprechaun, and to a nasty one at that. The leprechaun, through "Leprechaun Logic"--whatever that means--comes to retrieve his belongings. The Irishman manages to crate up the leprechaun for 10 years--just long enough for a very hot and young Jennifer Aniston to appear, accompanied by her non-presence father and a variation on the Three Stooges. You can pretty much guess the rest. All of this is even more inane in execution than it sounds, but for willingly going in that direction, there's one thing it isn't--funny. It is irritating--especially Warwick Davis' portrayal of the titular character. He utters, and the entire script in fact is riddled with, cliches that are as scary and funny as telling coworkers to not step on cracks or they'll break their mothers' backs. And Davis does it with a grating laugh and spritelyness that suggests that Mark Jones lifted a lot of his ideas wholesale from Lucky Charms commercials, which were also never very frightening or funny. The characters of Ozzie and Alex (Mark Holton and Robert Hy Gorman, respectively), two of the Three Stooges ("Three Guys That Paint" in Jones' world), are one of the few redeeming elements. Holton does a good job of providing a caricatured Ozzie, the straight, dull man, and Alex is a sharp witted punk, beautifully realized by Gorman, who, at 13, must have thought this film was a bigger break than the rest of the cast, who mostly seem to be embarrassed and made little effort. Well, except for Davis, who overacts to an extent that you're tempted to join in with your own shotgun and shoot the t.v. 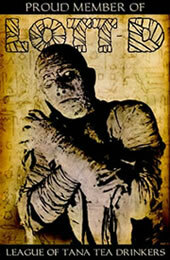 I have yet to watch the sequels to this film. While I may be proven wrong, I can't imagine that they'll be worse than this one.